At The Presser Foot, you will find the largest selection of high quality threads, notions and embroidery designs in Northern Colorado. 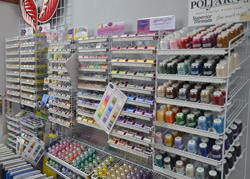 At each of our locations, you will find high quality thread in all weights, colors and types for sewing, overlockers, embroidery, quilting and embellishing. We stock thread from Aurifil, YLI, Mettler, Isacord, Floriani, Superior Threads, Yenmet and Madeira. Whether you want metallic, rayon, polyester, cotton or blends, we're sure to have what you need for your project! The Presser Foot is proud to carry a variety of notions for sewing, embroidery, quilting—many of which you won't find in a big box store. We have stabilizers from OESD, Floriani and more for every type of embroidery or sewing application you can imagine. 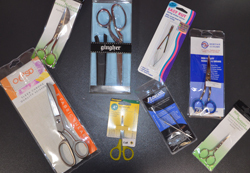 We stock scissors, snips and rotary cutting supplies from Floriani, Gingher, Nifty Notions, Martelli, Olfa and more. Our notions walls also have special hardware for bags and purses, including a rainbow of zippers in a variety of lengths. We know that only the best quality embroidery designs will give you perfect results, so we sell only the best from sources that know how to digitize! We have designs from Lunch Box Quilts and Smith Street Designs for those of you who love using your embroidery machine to create beautiful appliqué quilts and blocks in the hoop. If wall-hangings that utilize multiple hooping are your thing, you will love the designs from Claudia's Creations. 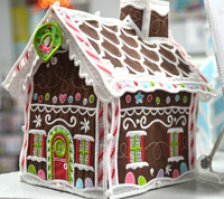 Just looking for the latest, cutest and fun designs for creating your own projects? We have them—OESD (Oklahoma Embroidery Supply and Design), Bird Brain Designs, Amelie Scott, Floriani, Pickle Pie Designs, Anita Goodesign and more have everything from mug rugs and zippered bags done in the hoop and children's soft fabric books to designs that look like hand embroidery, stuffed animals and free-standing lace ornaments and villages! New designs come in all the time, so come in and see what we've got—we promise you won't be disappointed. Shop online with Embroidery Design Studio today—just click on the butterfly to the right to get started!